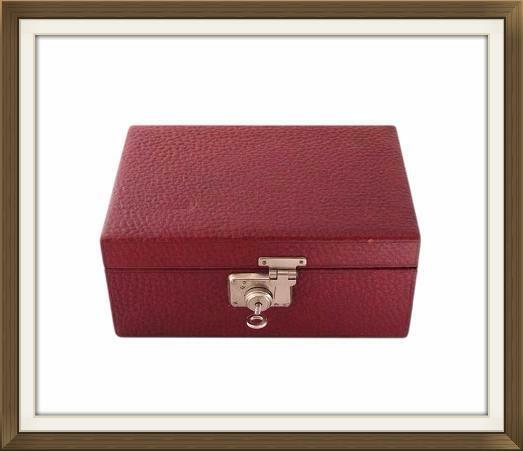 This is a lovely vintage jewellery box, dating to the mid 1930s. It is complete with its original working lock and comes with a key. This box has a textured burgundy leather finish and a white metal lock and catch. The lock has a quality English lever and has a trademark stamp highlighting this. A key has been provided which is a vintage replacement. This locks the box securely. 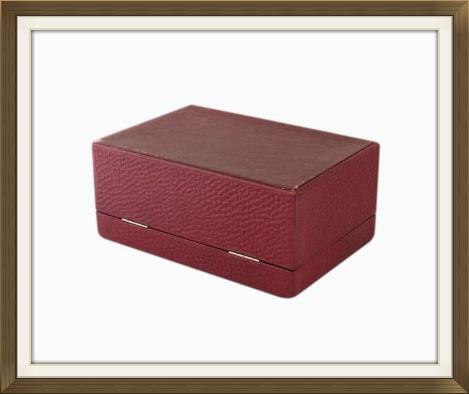 The box has its original white metal stop hinges which prevent the lid from falling back. The metal matches that of the lock. The bottom of the box has its original burgundy vinyl covering. We have given the leather a treatment which feeds, protects and softens it. This has revitalised its colour and has also made it more supple. The key turns clockwise to lock the box. 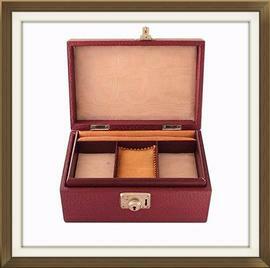 The interior has its original storage tray which has 3 compartments and a ring storage section. Beneath this is a larger single compartment. 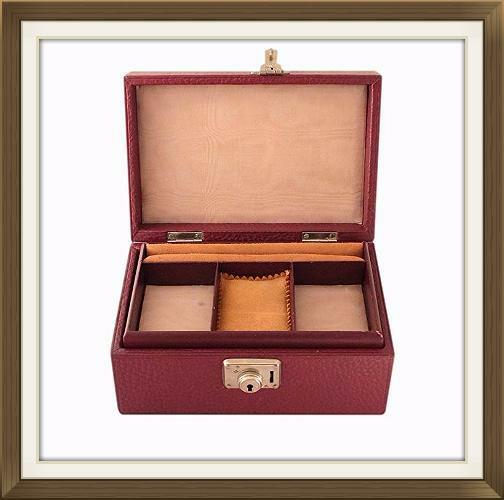 All of the compartments plus the inside of the lid, have their original quality watered silk linings. 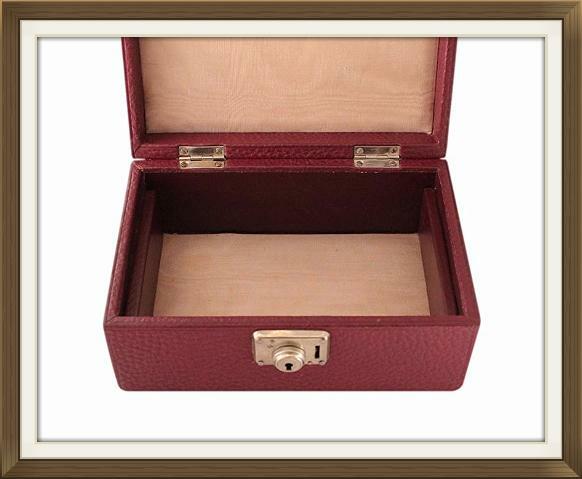 The ring storage section has a soft faux suede covering, and there is a matching faux suede pad in the centre compartment. The walls of the tray and base compartment have their original burgundy vinyl coverings. These match the vinyl on the bottom of the box. This box is in lovely vintage condition and is of sound structure. There is minor light wear to the leather and vinyl as we'd expect on a box of this age. The leather to the lid has a few minor faded areas. This is not very noticeable. The interior watered silk is in very good condition with no splits or fraying. That to the compartments have minor foxing/minor stains. The box still locks securely and the hinges are still in perfect working order. They are already very old and will naturally have some wear from age and use. We are not responsible for locks that malfunction from further age and use once boxes are purchased. 15.5 by 10.5cm with a 3.6cm depth. All 7.2 by 5.1cm with a 1.9cm depth. Holds approximately 7 rings depending on their sizes. International postage is £25, delivered fast within 3-5 working days to Europe and 5-7 working days to the rest of the world. Postage is by Royal Mail International Tracked & Signed.